I'm Erin Ross, mother of two young girls, daughter of a former Catholic nun, and grand-daughter of a long line of feisty Italian matriarchs. A few years ago, after a tough day with my emotional five year old, a friend comforted me with a saying she had heard somewhere that being a mom is the shortest and steepest path to enlightenment. Her wise words brought me peace and a sense of community among women on this ancient journey. A few weeks later another friend was struggling with an issue with her son, and I repeated the words to her. "Wow", she said, "you should make that statement into a bumper sticker." 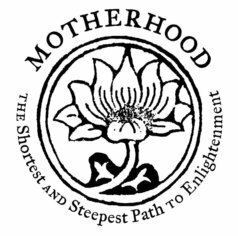 Please Note: The motherhood lotus sticker design is the trademarked property of Erin Ross, Straw Cottage Designs. Use or reproduction of the design is prohibited without permission, and payment of annual licensing fee. To obtain permission, please contact Erin at 520-604-1009. Thank you.